Buried glaciers have been spotted on Mars, in a 'game changing' development that could provide unlimited water for the first human visitors to the red planet. It offers new hints about how much water may be accessible on the Red Planet and where it is located. Erosion has exposed eight ice sites, some as shallow as a few feet (one meter) below the surface, and going as deep as 100 meters or more, researchers said. 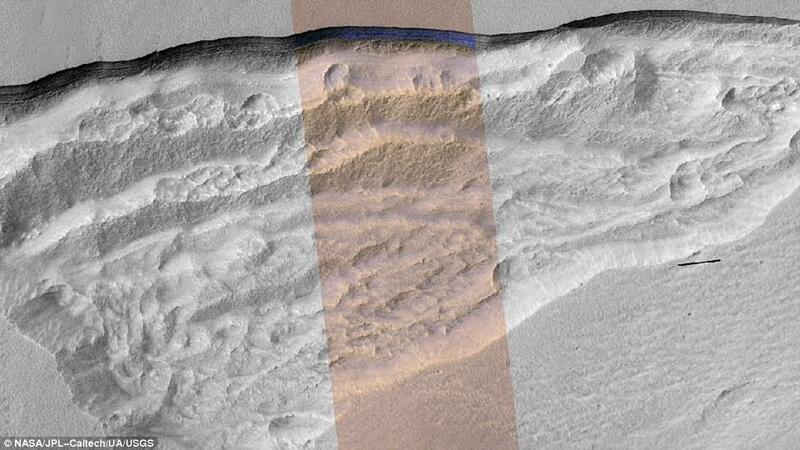 These underground cliffs appear 'to be nearly pure ice,' say the researchers, who analysed data from the Mars Reconnaissance Orbiter, launched in 2005. 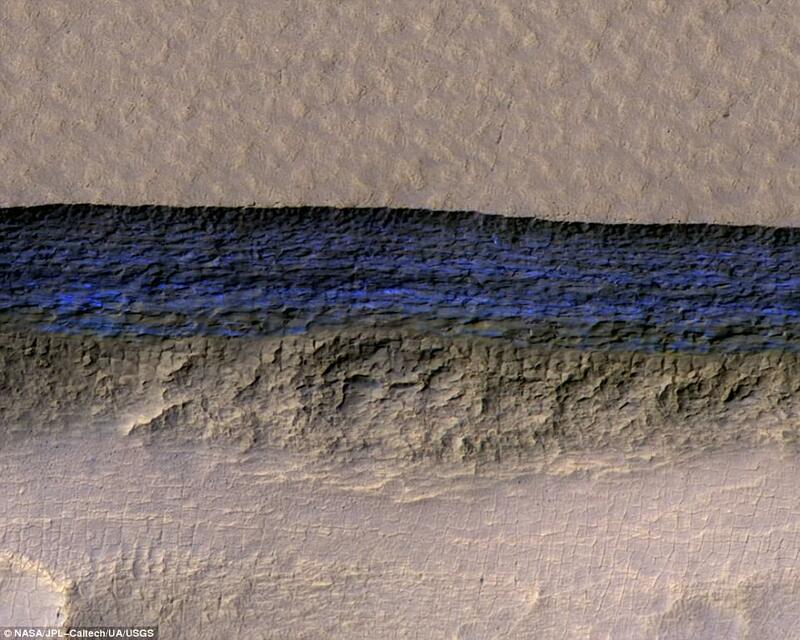 A cross-section of underground ice is exposed at the steep slope that appears bright blue in this enhanced-color view from the HiRISE camera on NASA's Mars Reconnaissance Orbiter. The scene is about 550 yards wide. The scarp drops about 140 yards from the level ground in the upper third of the image. 'Humans need water wherever they go, and it's very heavy to carry with you,' said Shane Byrne of the University of Arizona Lunar and Planetary Laboratory, Tucson, a co-author on today's report. 'Here we have what we think is almost pure water ice buried just below the surface. 'You don't see a high-tech solution,' Byrne added. 'You can go out with a bucket and shovel and just collect as much water as you need. I think it's sort of a game-changer. The sites are in both northern and southern hemispheres of Mars, at latitudes from about 55 to 58 degrees, equivalent on Earth to Scotland or the tip of South America. The cliffs are all near the poles, which slip into a frigid darkness during the Martian winter and would not be a suitable site for a long-term human camp. However, if a sample could be drilled from one of the glaciers, researchers could learn plenty about Mars' climate history and the potential for life on Earth's neighboring planet. The scarps directly expose bright glimpses into vast underground ice previously detected with spectrometers on NASA's Mars Odyssey (MRO) orbiter, with ground-penetrating radar instruments on MRO and on the European Space Agency's Mars Express orbiter, and with observations of fresh impact craters that uncover subsurface ice. At this pit on Mars, the steep slope at the northern edge (toward the top of the image) exposes a cross-section of a thick sheet of underground water ice. The image is from the HiRISE camera on NASA's Mars Reconnaissance Orbiter, with an enhanced-color central swath between grayscale on each side. 'It's like having one of those ant farms where you can see through the glass on the side to learn about what's usually hidden beneath the ground,' said Byrne. Scientists have not determined how these particular scarps initially form. However, once the buried ice becomes exposed to Mars' atmosphere, a scarp likely grows wider and taller as it 'retreats,' due to sublimation of the ice directly from solid form into water vapor. At some of them, the exposed deposit of water ice is more than 100 yards, or meter, thick. 'This kind of ice is more widespread than previously thought,' said Colin Dundas, a geologist at the US Geological Survey in Flagstaff, Arizona. Images taken over the course of three Martian years reveal massive chunks of rock that fell from the ice as erosion occurred, leading the researchers to estimate that the ice is retreating a few millimeters each summer. NASA's plan to make Mars a prison planet sounds on schedule.